Boil the lasagna in salty water according to the instructions on the package (about 7-10 minutes). Drain. Meanwhile, in a big skillet, take oil and ground beef, sauté over medium heat. Once the ground beef changes color, stir in onions. Saute for 3-4 minutes and add pepper and tomato paste. Cook for a few minutes. Then, add tomatoes, salt and hot water. Cook for about 5 minutes or until tomatoes are cooked. Sprinkle with black pepper and turn the heat off. Prepare the béchamel sauce using the link. Spread 2 spoonful of tomato mixture over the lasagna tray or Pyrex. Then cover with 3 piece of lasagnas. Divide the tomato mixture in 3 equal parts and the béchamel sauce in 4 parts. Spread one part of béchamel over the first layer of lasagna, followed by the one part of tomato mixture. Then, cover with three pieces of lasagna. Do the same procedure until having 4 layers of lasagna. 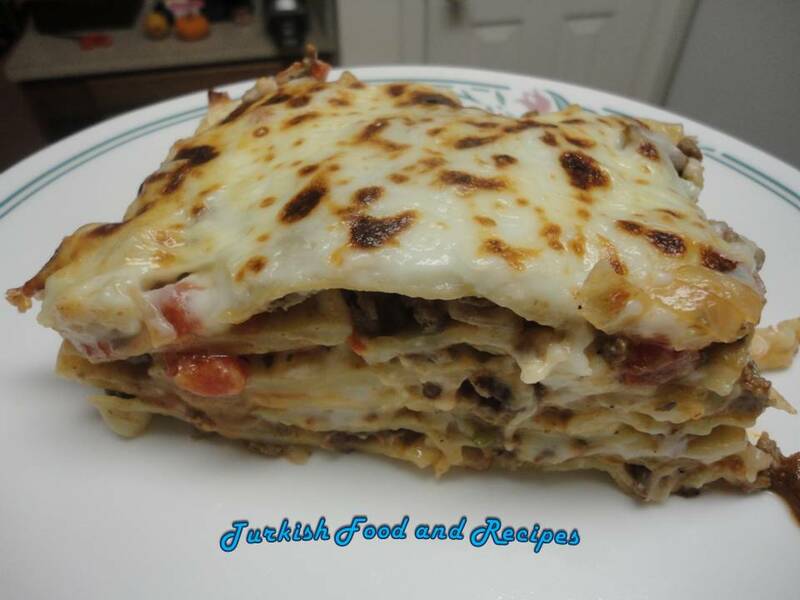 Spread the remaining béchamel sauce all over the top and cover with shredded mozzarella cheese. Cover the whole tray with aluminum foil. Bake at 400 F (200 C) oven for 30 minutes. Then, take the aluminum out and continue baking uncovered for about 10-15 minutes or until it gets light brown. Cut into pieces and serve hot/warm. Lazanyalari paketin uzerindeki tarife gore yaklasik 7-10 dakika tuzlu suda haslayin. Bu sirada, buyuk bir tavada yagda kiymayi cevirin. Rengi degistikten sonra sogani ilave edin. Yaklasik 3-4 dakika sote ettikten sonra, biber ve salcayi ilave edin ve pisirmeye devam edin. Son olarak tuzu, domatesi ve suyu ilave edin. Domatesler pisene dek yaklasik 5 dakika kisik ateste pisirin. Uzerine karabiber serpin ve ocaktan alin. Besamel sosu linkteki tarife gore hazirlayin. Lazanya tepsisi ya da borcam tepsinin altina iki kasik domatesli kiymali harctan koyun ve dibine yayin. Geri kalan harci 3 esit miktara bolun. Besamel sosu 4 paya bolun. Uc parca lazanyayi tepsiye dizin, uzerine boldugunuz besamel sosun bir payini yayin. Onun da uzerine yine bir pay harci esit olarak dagitin. Tekrar 3 tane lazanya ile uzerini kapatin ve ayni sekilde besamel sos ve harctan yayarak toplam 4 kat lazanya olacak sekilde devam edin. Son lazanya tabakasini yerlestirdikten sonra geriye kalan son besamel sos payini esit olarak yuzeye yayin. Kasar peyniri esit olarak dagitin. Aluminyum folyo ile tepsinin uzerini tamamen kapatin. 200 C (400 F) firinda 30 dakika kadar pisirin. Aluminyum folyoyu cikarin ve yaklasik 10-15 dakika uzeri acik olarak, kizarana dek pisirin. Dilimleyin ve sicak servis yapin. what a great perfect it’s look delicious i will make them soon. thank you very much. Perfect dish for a cold evening. Nice job.